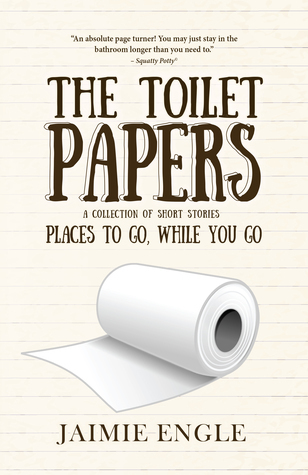 From the mind of the critically acclaimed author, Jaimie Engle, comes The Toilet Papers: Places to go, while you Go. This collection of short stories ranges from 50 words to more than 50 pages, separated in categories labeled to fit your bathroom needs: NUMBER ONE, NUMBER TWO, and FARFROMPOOPIN. The idea is to give you, the reader, a great deal of material to read, tailored and categorized to the needs of your intestines and bladder. So go ahead, get comfortable, pull out your Squatty Potty® and enjoy some fantasy, science fiction, horror, adventure, and humor from the comfort of your own throne…the john…the latrine…your office…the bathroom, whatever you want to call it. Just be sure to wash your hands once you’re done. Ever wanted a good book to read on the toilet? Well, you are in luck with The Toilet Papers: Places to go, while you Go because it is the perfect bathroom book. Now, I will admit, I didn’t read this book while on the toilet. My thinking was that a Kindle near water (any sorts) and my inherent clumsiness would end up being a disaster. So, I read it from the comfiness of my couch (in between bingeing with BK on Stranger Things). I can’t even begin to express how much I enjoyed this book. I was horrified during parts, laughing during other and a strange combination of the two during even other parts of the book. Roadside Vendor. Let’s just say that I will never look at hot dog stands/lunch trucks that same way after reading that short story. It freaked me out…lol. Picture Window. Just plain creepy. As Fate Would Have It: Again, a creepy story that stayed with me. The Sword of Kusanagi (from Clifton Chase and the Arrow of Light): I reviewed Clifton Chase a while back for the author and this chapter of the book was one of my favorites. This is a book that I would definitely buy as a gift and for myself, so BK could have a book to read in the bathroom. Why: A well-written book of short stories that will keep your attention while you are using the bathroom.